As developers, we often build scripts and tools to sharpen our workflow. One of the simple scripts that I am refining is palm-run, my swiss-army knive of a tool that deals with packaging, installing, launching, and tailing logs as I develop my application. I wanted to go into a bit of detail on this one. When you build an app you want to have different builds for development and production. In development, you want debugging turned on with verbose output. In production, you want to exclude all but the necessary files. The latest version of palm-run lets you tell it that you fancy production mode via -P.
Now you are set. To see a shell app that uses this, check out palmrun-configtest. If you build the app you will see that there isn’t console output if you palm-run with the -P option. What else would you want a high level program like this to do for you? When Ben and I joined Palm to run Developer Relations, we knew that we wanted to eat dogfood pretty quickly. We have had some mobile related projects in the past, but they were either mobile Web sites, or Java based. Being able to take our web skillz to rich mobile devices was much more new and exciting. Building sample code and apps is useful for developers, and the team will be doing plenty of that (e.g. this is how you use the awesome List widget in every which way, and why you would do X, Y, or Z) but building a production app is a whole different level. We wanted to learn what it is like for our developers to design, build, and distribute webOS applications. We could have started with a smallish app, but no :) Instead we took the great work of Justin Newitter (who built the original app) and went running with an updated Facebook app. Along with other great developers in the dev relations world, we have gotten our first early release out there today. We have definitely learned a lot in our short time on the app, and this is the first release of many. I really want us to have a regular cadence to our releases. If there is a feature you are excited about let us know. We added a broad feature set to the application. 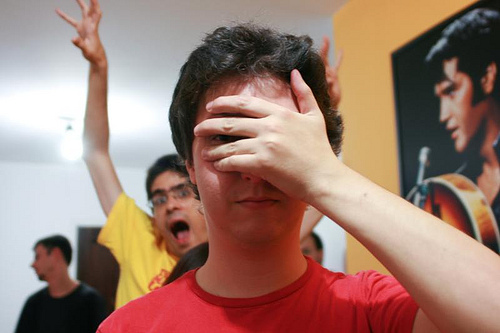 The first Facebook application was very much about synergy. Why put something in an application silo when you can bake it into the platform? 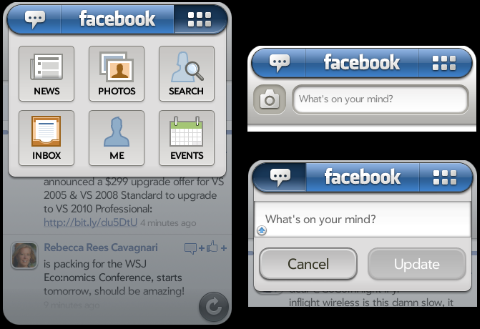 I still contend that webOS is the best platform for Facebook users as it integrates throughout. Other mobile platforms do some of this, but I think we continue to do the best job here. There are a bunch of Facebook features that our users still wanted though, so we worked with Facebook themselves to prioritize this list. The top features were access to Facebook Mail, full profile access (info, wall, and photos), people search, events and birthdays. We also wanted to do interesting things to the UI as we bring in these features. Oh, and a couple of mini-easter eggs. Designing the application was challenging and a lot of fun. 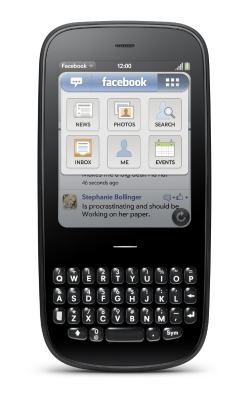 At a high level, working out a design that is true to webOS *and* a strong brand such as Facebook was a balancing act. You will run into this same issue even without a brand like FB. How does it have your DNA and still fit in with the core platform. This has been a design consideration since the dawn of time. Do you make a clean Mac app that looks like Mail.app? Do you do your own UI that looks like a funky Flash UI? Most of the time you are in the middle. One feature that we spent time on was the base navigation. We wanted to make it incredibly easy to get to features you use often, and also quick to get to all features. The root of the application is the news feed. Some Facebook apps have an icon window as the root, but we decided to behave more like the Facebook website itself. The news stream is the blood line, so start there. No matter where you go in the app, if you back gesture away…. you will always end up at the news stream. Also, just like the iPhone app, we share the shake gesture as a way to refresh the data here. Shake away. webOS devices have hardware keyboards and are great for creating content. In the Facebook context this means updating your status and uploading photos are prime ways to get your content into the system. For this reason the top left area is your way to always get to your current status and update on it. In fact, if you are on the new stream, just start typing and the update area will pop down and capture your new status (while showing your last one below). Also, if you click on the camera icon, you are sent into the core photo experience on the device which natively supports uploading to Facebook. For all other features, we wanted to give you a quick way to access them. Click on the top right grid and a pop down will immediately appear, giving you one tap access to any feature. No need to switch to a navigation screen first. We are also playing with the ability to use that hardware keyboard by giving you quick key access to any feature (e.g. SYM + E == sends you to events). Is that a good idea? The Facebook logo itself has some hidden love. In an homage to to websites, a tap on the logo takes you home…. which means back to the news stream. If you are on the news stream already, and have flicked down…. that same logo will bring you to the top. We are excited to offer access to data that Facebook users haven’t been able to get in an app before, but where do we go from here? We definitely want to do a lot of polish on various sections that we have out there. One idea that I have been playing with from the get go is doing something immersive when you rotate the screen when in a news feed. Instead of just having the news feed work in that format, what if the content took over. I mentioned this in my last post about touch UI. I flick through the stream and if on photos, the album takes on the entire screen for example. There are some other really fun features that revolve around webOS notifications and giving you a great way to “never miss a thing” (life moves fast you know ;) and choosing what content matters to you. And, finally, we have to work out what makes sense in an app, and what could be baked into the platform. Giving access to birthdays is great, but would you like to have them as a calendar on the device? Maybe, but you would definitely want to be able to turn that view off…. and in fact you may already have birthday info in your profiles, so we should have one unified birthday view. Life gets more complicated when you go to the generic doesn’t it. Again, we have just started here, but would love to hear from you on our feedback area in the app page. Thanks to the team that played a part in this release! We haven’t reached Joe Hewitt foo yet, but we are having fun!